We are excited to announced that Capital District Clean Communities will be working with another intern from the Clean Cities University Workforce Development Program this Summer. We have been lucky enough to work with two interns from this program in the past who have been invaluable to the Coalition. This is a wonderful opportunity for students looking to gain experience in the energy and transportation areas. Please pass this information along to anyone you know who may be interested in one of these 34 positions. The online application process closes on April 15, 2014, so applications and resumes must be submitted by that date. Applications can be found at http://www.cvent.com/d/t4q2ds with more information below. If you have any questions, please email cleancitiesintern@anl.gov. 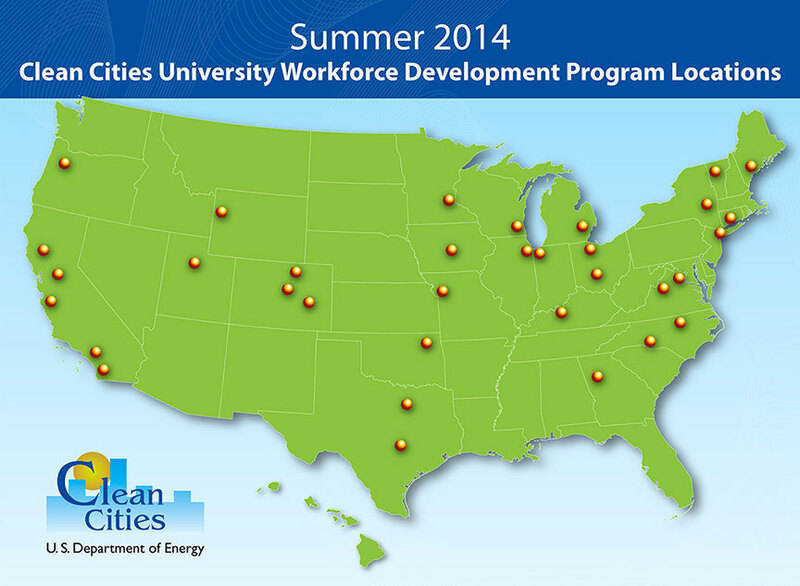 The Clean Cities University Workforce Development Program is an initiative of Clean Cities, a government-industry partnership sponsored by the U.S. Department of Energy’s Vehicle Technologies Program. Clean Cities strives to reduce petroleum consumption in the transportation sector in nearly 100 communities across the country. Since the creation of the CCUWDP in 2010, Clean Cities has hosted more than 200 interns in more than 60 Coalitions.The Clean Cities internship will give students studying communications, public relations, business, marketing, engineering or environmental sciences, the opportunity to grow public awareness and expand the markets of advanced vehicle technologies, alternative fuels, and practices that reduce the consumption of petroleum. Stipends range from $3,600 – $6,000 per semester depending on academic classification and number of hours assigned by the coalition. Find alternative fueling stations near an address or ZIP code or along a route in the United States. Enter a state to see a station count. If you know of a station that is not on this map please contact us. In the market for a new car? Compare cost of ownership and emissions for most vehicle models. The Alternative Fuels Data Center offers a large collection of helpful tools. These calculators, interactive maps, and data searches can assist fleets, fuel providers, and other transportation decision makers in their efforts to reduce petroleum use.